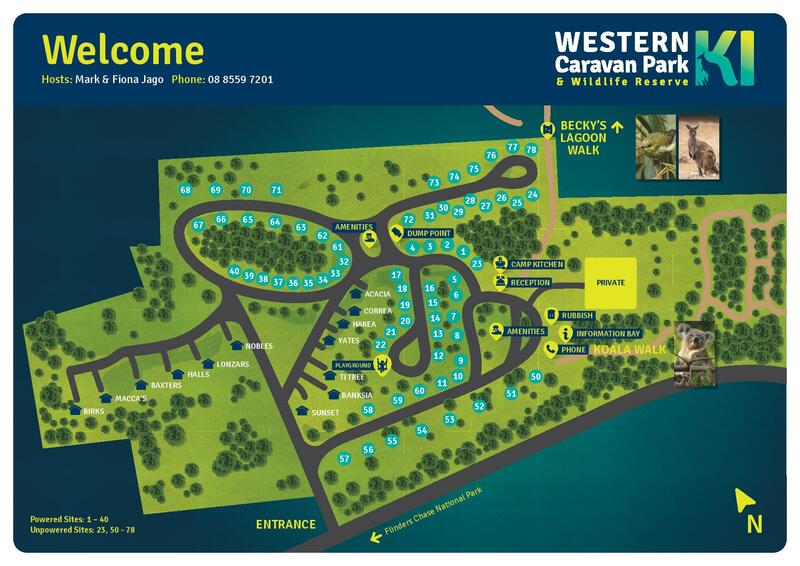 The Western KI Caravan Park is ideally situated on 17ha of natural bush and grassland right next door to the internationally acclaimed Flinders Chase National Park (Cape duCouedic, Admirals Arch, Remarkable Rocks etc.) and Kelly Hill Conservation Park (Kelly Hill Caves). The caravan park has many exciting attractions including a host of wildlife species such as koalas, wallabies, possums, kangaroos, echidnas, goannas, cockatoos and cape barren geese. These can all be observed on the various walking trails or within the park. Cypress pine log cabins, park cabins, powered sites, non powered sites, shelter shed with gas barbecue, camp kitchen with seating available for up to 50 people and modern toilet/shower block and laundry are all part of the wonderful facilities this park has to offer. A kiosk is also available providing essential foods including meat, bread, ice, gas refills and bait as well as a residential liquor licence. Please note: A $20 surcharge applies for 1 night bookings on all cabins. Minimum night stay of 3 nights in all cabins over Christmas and Easter holidays. If booking over Christmas/New Year period for campsite bookings, please inform us of what you are camping in and the size to help with site allocation. If you have any children can you also please advise of their ages. Also on the Easter long weekend, Good Friday to Easter Tuesday. Staff reserves the right to move cabin bookings to a cabin with the same price to accommodate all quests in busy periods. Note: prices are for direct bookings only. Note: Cancellation Conditions apply to cabin accommodation. To secure a confirmed booking credit card details are required as security for the accommodation charges (one night deposit is required). This secures your booking for the period of your intended stay and guarantees your cabin or campsite upon arrival. Cancellations 30 or more days prior to your arrival date. Full refund minus a $10 administration fee. Cancellation 30 to 14 days prior to your arrival date. You will be charged 10% of the total booking unless we are able to rebook all nights if so you will be refunded full amount minus a $10 administration fee. Cancellations 14 to 7 days prior to your arrival date. You will be charged 50% of the total booking unless we are able to rebook all nights if so you will be refunded full amount minus a $10 administration fee. Cancellations less than 7 days prior to your arrival date. You will be charged 80% of the total booking unless we are able to rebook all nights if so you will be refunded full amount minus a $10 administration fee. In the event of a failure to show on the booked date you will be charged the full amount of the booking. No refund. Wildlife and pets are not compatible. Unfortunately we don’t have wifi access and mobile coverage is limited to Telstra next generation so you will need this service for both mobile and internet connection. Thank you from Mark & Fiona Jago and staff.